The Manufacturing Market Insider (MMI) has again announced their list of the top 50 EMS providers for 2013. MMI is a publication dedicated to the contract manufacturing sector that shares reports, market analysis and trend spotting. Each year MMI complies a list of the world's largest EMS providers who are ranked based on their 2013 sales in U.S. dollars. This year's list has seen one big change with Pegatron, who didn't even make it into last year's top 10 list, jumping up to the number two position. 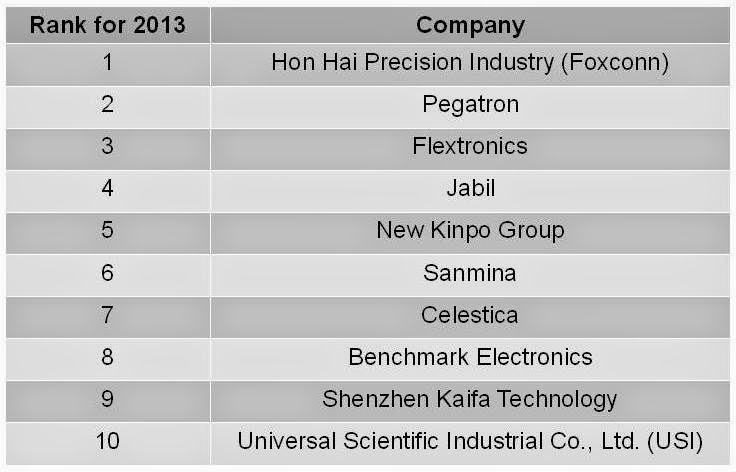 The remainder of the top 10 companies have all stayed relatively stable, with only Plexus being knocked out of it's top ten position this year. To read the top 50 list in full, please visit the MMI website. In 2013, the top 50 sales reached a new high of $254.3 billion which was a growth of 1.9%, evidencing that the industry is still on the up. Atlantis Electronics Launches NEW Website!